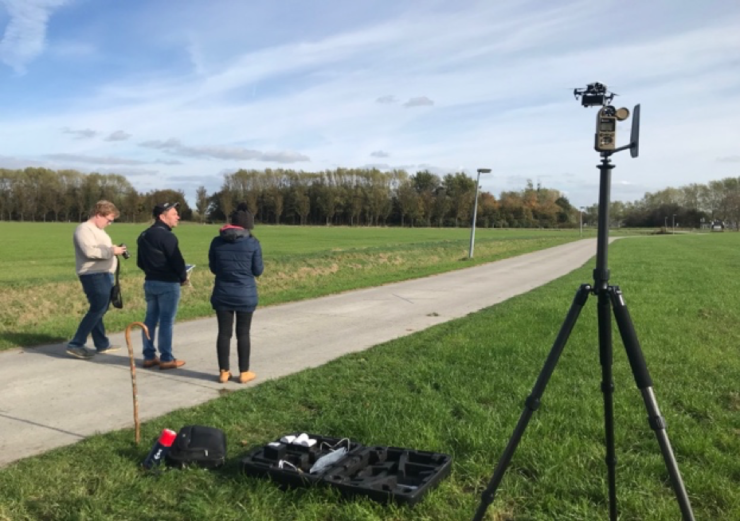 MEMO2: MEthane goes MObile – MEsurements and MOdelling | Semra Bakkaloglu - What an adventurous secondment! 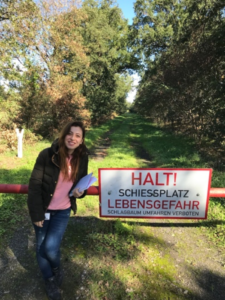 Semra Bakkaloglu – What an adventurous secondment! I am not going to tell about the love story, but this might be a blog for the broken-hearted. Please be ready to read about the worst time I have ever had. The story began with losing my Biometric Residence Permit – which lets me live in UK – during the ICOS (Integrated Carbon Observation System) conference in Prague. 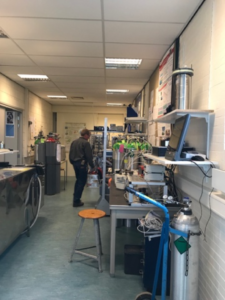 I wanted to go back to the UK for one week to attend the isotope workshop at RHUL (Royal Holloway, University of London) and then go to Groningen, the Netherlands, to start my secondment at RUG (University of Groningen). However, because I could not enter the UK without the visa, I jumped from Prague to Groningen to do my secondment. No worries, I am not going to tell too much detail about how I survived in Groningen with hand baggage containing summer clothes, my first day bike accident, a broken screen on my MacBook and torn contact lenses. Despite having Devil’s own luck, I have settled in Groningen and finished my secondment with the great leniency of people from RUG, especially Prof. Dr. Huilin Chen and Katarina Vincovic. 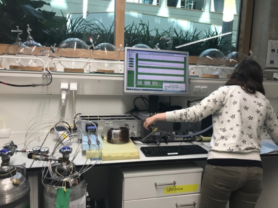 By the way, my main research topic is to analyse methane emissions from waste sources, mainly landfills, waste water treatment plants and biogas sources in Europe, primarily in the UK. I use mobile methane instruments, Picarro and LGR at RHUL; and IRMS (Isotopic Ratio Mass Spectrometry) to identity the isotopic signature of methane from different waste sources. 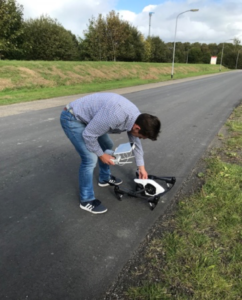 During my secondment, the main aim is to join a campaign in the Netherlands and learn the basic principles of unmanned aerial vehicle (UAV)-based active AirCore measurement. 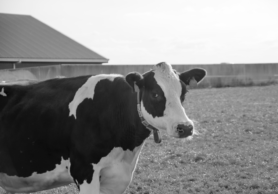 During my secondment, I have been on four mobile surveys and one UAV-based active AirCore survey at a cow farm. My first campaign was to Meppen, Germany to measure peat fires which were started by Germany’s military testing rockets in the area. However, we did not see a big plume from the fire because the area was enclosed by the army and we could not get close to the burning area, but we achieved to catch some methane emission from the fire. 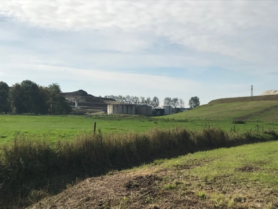 Moreover, there were three other methane sources sampled during that campaign at Akzo Nobel site, Groengas Hoogezand Biogas Plant and Dutch gas well production site. 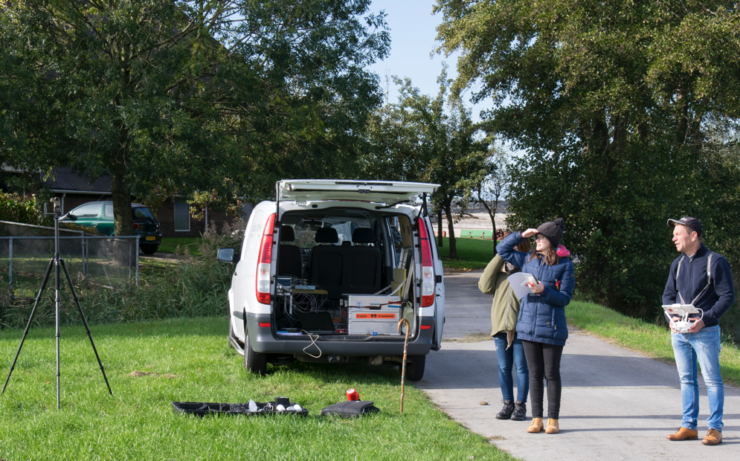 The other three mobile surveys were in Groningen city. 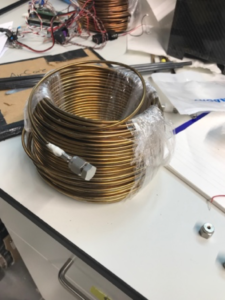 I also did night measurements with Martijn Oudshoorn, a master student at RUG. Surprisingly, there were less gas leaks in Groningen compared to London city! 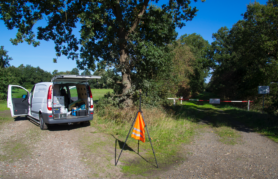 We just found one gas leak around Groningen Hospital throughout these campaigns. 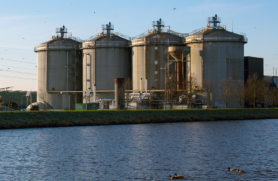 The major methane sources were Woldjespoor Biogas Plant, Stainkoeln 2 Landfill and a Sugar Beet factory in Groningen. 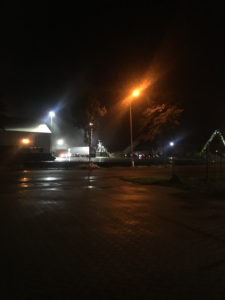 Especially, during the night measurement, everywhere around the sugar beet factory smelled like chocolate! I collected in total 35 samples from all the campaigns and measured their isotopic signature using IRMS at RHUL. 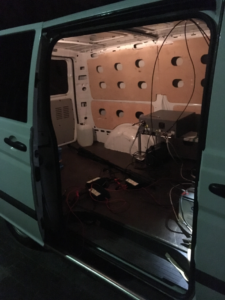 Night measurement at 5 am! 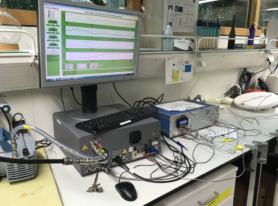 I also visited the Lutjewad sampling station, where continuous measurements of atmospheric CH4, CO2 and CO are made by a Picarro analyser. 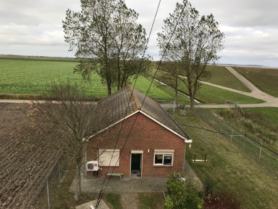 My last campaign was at the Grijpskerk cow farm. 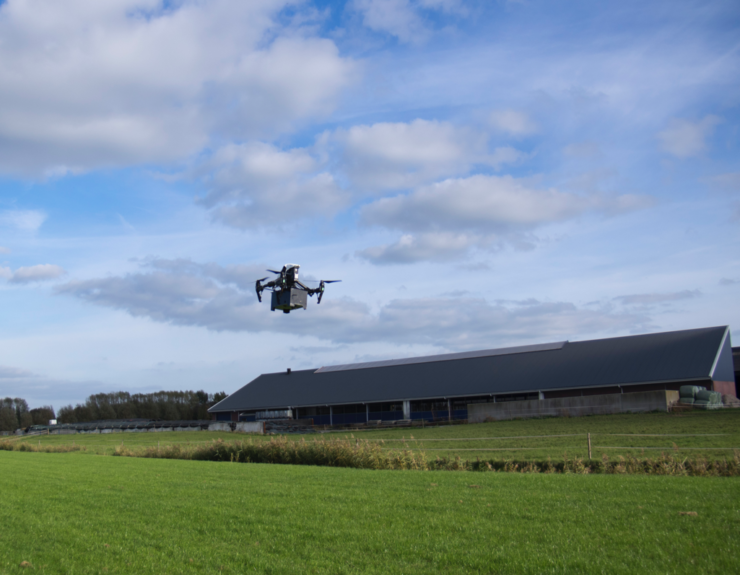 The UAV AirCore was used to collect air samples of the plume. 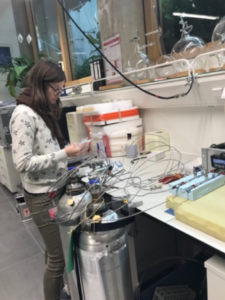 The plume in the AirCore was measured directly by the Picarro after the flight, and the air samples after analysis were collected in 0.6L bags, which allowed me to measure two times the isotopic signatures using IRMS. I would emphasize that we did several test flights before going on campaign! The last but not the least adventure was to listen to Ban ki-moon’s amazing speech on 17th October, 2018. 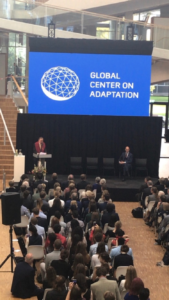 He opened the Groningen office of the Global Center on Adaptation in Groningen which is an international organization to help societies around the world become more resilient to climate-related threats. It was a highly motivational speech for my PhD study. Look, how my luck came back! Eventually!!! I got lots of good data, which will be published later. As expected, gas samples are more depleted in 13C (carbon-13). Less negative values point to dominate fossil methane, more negative values to biogenic sources like peat fire, biogas , landfill, the sugar beet factory and cow farms. So we learned a lot about the sources of methane measured during our campaigns. To sum up, even though I was in very difficult situation, Groningen was so generous to me to fix everything. I had an amazing time at Groningen by learning so many new things in a lovely environment. 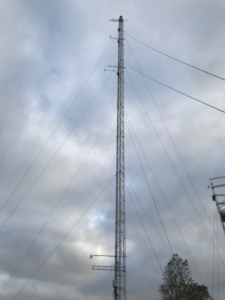 This project has received funding from the European Union’s Horizon 2020 research and innovation programme under the Marie Sklodowska-Curie grant agreement No 722479.